Arthritis is a term used to describe inflammation of a joint and around 10 million people in the UK are affected (source NHS website), including children. The two most common types of arthritis are osteoarthritis and rheumatoid arthritis. Osteoarthritis (OA) is the most common type of arthritis, affecting around 8 million people in the UK. 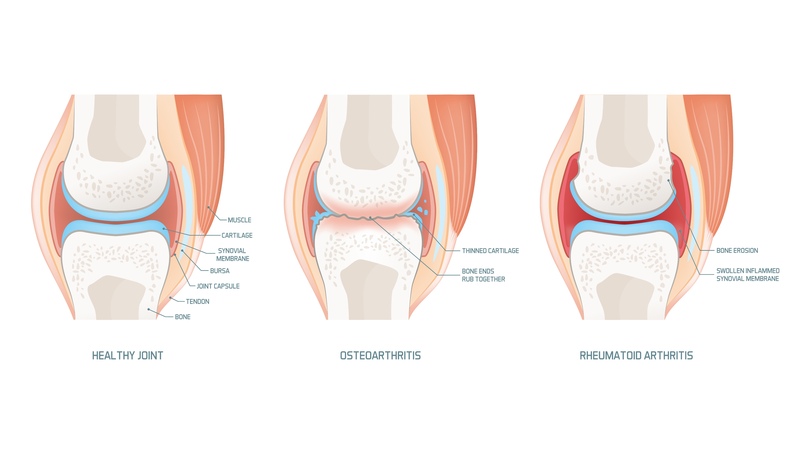 OA is when the cartilage in a joint is damaged or is thin, causing the bone underneath to thicken which can sometimes grow into boney spurs outside of the joint (osteophytes) and increase fluid in the joint. The body will also thicken the ligaments around the affected joint to stabilise it. All these changes can give the appearance of swelling and reduce range of motion of a joint, but they are attempts by the body to heal the damage. These changes to a joint can force them out of their normal position, which can cause pain when using the joint, such as walking. OA is more commonly known as ‘wear and tear’, as it affects the most frequently used joints in our body, such as, the neck, lower back, hips, thumbs, fingers and big toes. The second most common type of arthritis is Rheumatoid arthritis (RA), affecting around 400000 people in the UK. RA is an auto immune disease (when the body starts attacking its own cells and tissues instead of unwanted foreign cells) that causes inflammation of the joint fluid and degeneration of the joint surfaces and is most commonly seen in the hands and feet. It is unknown as to what actually causes RA, but there is increased risk if you are female and if RA runs in your family. As RA is an auto immune disorder, there are normally other symptoms that accompany the joint pain and stiffness, such as fatigue and fever. Manual therapy such as Osteopathy, massage and acupuncture can help with the side effects of arthritis, as they can help maintain joint mobility, reduce fatigue, improve circulation and therefore reduce swelling in the joints and help reduce muscle soreness.